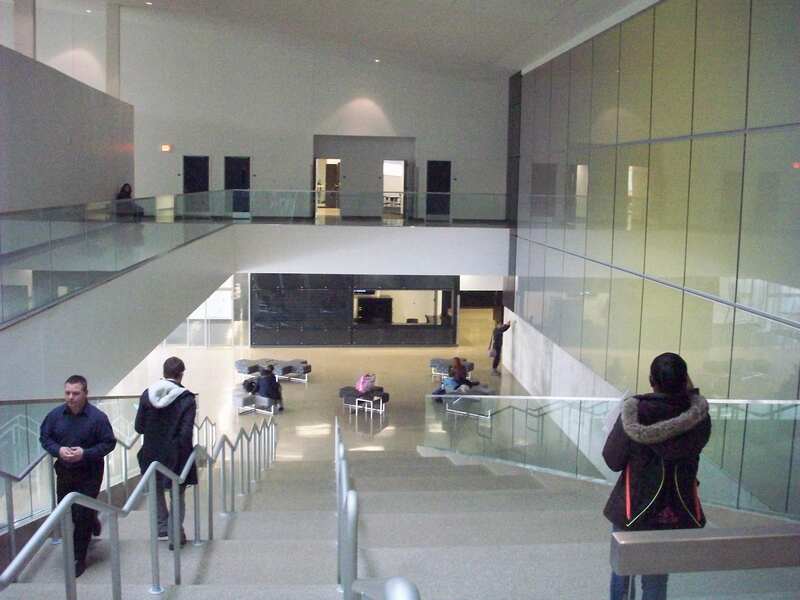 The main lobby in the Wolfe Center is a place where students can relax during the day. Photo by Amanda Flowers. The construction has ended and classes are beginning. The Wolfe Center for the Arts opened its doors for classes this spring semester. Planning for the Wolfe Center began in 2006 and construction started in 2009. The cost of this building is $42 million, and the money came from private, local and state funds. The Wolfe Center is named after Fritz and Mary Wolfe, who gave the lead private gift of $1.5 million. The Wolfe Center was designed by SNØHETTA, an international architectural firm from Norway, and the Wolfe Center is SNØHETTA’s first completed American project. A lot of decision making was put into the Wolfe Center. The decisions included everything from how the theaters and classrooms looked, to how the black and white tiles were placed in the bathrooms to resemble a subway. “This is a wonderful experience,” said Ron Shields, chair of the theater and film department, who sat in on many meetings about the Wolfe Center. Many students like the Wolfe Center because of its unique look and the new theaters. Sophomore Allison Kump, who spends time in the Wolfe Center, said she likes the Wolfe Center’s modern design, and with the Wolfe Center being so open it will have a nice view when the weather cooperates. She also likes the new theaters because of the space and new technology. It will be a general upgrade. The Wolfe Center contains many classrooms and theaters for students and teachers to take advantage of. Everything in the building is brand new, Shields said. There is a familiar name in the Wolfe Center that came over from University Hall, which used to hold many theater productions. There is a brand-new Eva Marie Saint Theatre that seats 120 people. The theater will be dedicated in February, and its first show will be “Arabian Nights,” which will be presented Feb. 16-19 and Feb. 23-26. Another theater in the Wolfe Center is the Thomas B. and Kathleen M. Donnell Theatre, which seats 400, and has two independent orchestra lifts that can move to provide more seating. The first event happening in this theater is an orchestra/gala concert that will take place the same weekend as “Arabian Nights.” The Thomas B. and Kathleen M. Donnell Theatre will also host “Hercules” in March and the musical “Chicago” in April. Since the Wolfe Center has new upgrades compared to University Hall, students will be able to learn what it will be like to perform on a modern stage. Someday they may be on a stage in New York or Chicago, and the new theaters will prepare them for that experience, Shields said. “I think it offers students the best of the best,” BGSU spokesperson Jen Sobolewski said. This entry was posted on Wednesday, February 1st, 2012 at 9:43 pm	and is filed under Spring 2012, Student Contributor, Wolfe Center. You can follow any responses to this entry through the RSS 2.0 feed. Both comments and pings are currently closed.